In recent days I have been a peripheral part of an important conversation on Twitter centering on the issue of whether or not we believe our students’ explanations for their failure to complete work and/or attend class. I find this conversation very upsetting, because so many educators seem to miss the larger point. It doesn’t really matter if there is a dead grandparent or not. It is about your relationship with your students. I have been lied to in the past and I will be lied to in the future. Because humans lie. But I really hope that I have never prompted a lie because my students thought I wouldn’t understand. I also hope that if the day comes that I rank institutional rules over the well-being of my students that is also the day that I hand in my giant wad of keys. Building community is the most important work I do because it helps support learning and it makes class more fun, but it also means that I have relationships with my students (and vice versa) so I can know what is going on with their lives. I hope this helps to cut down on the lies and promotes honesty. It also means that I know a lot about my students’ lives and struggles. Most of my students are nontraditional. Most of my students are first-generation. 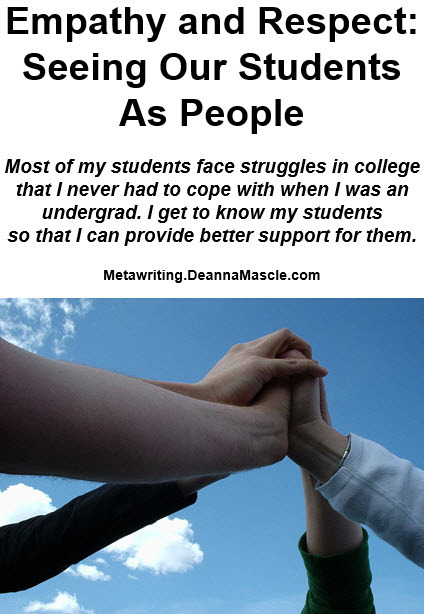 Most of my students face struggles in college that I never had to cope with when I was an undergrad. I get to know my students so that I can provide better support for them. I never want to be the reason someone dropped out of college. Do you? Here are three ways that I try to show my students some respect and empathy. All major assignments in my class have a firm due date – on the same day of the week at midnight for convenience – and those dates are (usually) set from the beginning of the semester. But in reality firm is more like firmish and I make it clear to my students that the due dates are intended to help us all plan our work weeks. I continue to accept without penalty work turned in while I am still grading (essentially taking the assignment and putting it at the bottom of my electronic grading stack) and if a student comes to me and asks for a grace period then I am usually happy to grant it. I love the student who comes to me before a due date and explains that life is happening (I make it clear from day one that I understand that life happens to humans) and they need some extra time. Sometimes we even renegotiate our calendar as a class because the best-laid plans of mice and men often go awry. I do my best to give students a look ahead for one to two weeks (my goal is two weeks but I don’t always achieve it myself) so they can manage their time and plan ahead. Other than actual face-to-face time I rarely give students less than a week to complete a task and even then I have let them know that the task is coming their way. For most of my students college is not their only obligation. Many have family burdens and jobs. Some may “only” be college students but are juggling health challenges or campus leadership responsibilities or just having a bad semester (I remember a few of those, don’t you?). Being able to work ahead or at least plan ahead can be a gift to the struggling juggler. For several semesters I have made it a point to maintain an electronic back channel with my students. I teach primarily online or at an extended campus so I hold no official campus office hours. This means students can’t drop in for a conversation or tutoring session, but maintaining the back channel means that students have a way to privately share their struggles and challenges. It is through that back channel that I learn many private details from my students about their lives – details that I would have no way to know about an online student. Even students I see face-to-face sometimes find it easier to make this connection virtually. I am also honest with my students about my own humanity and struggles with life (sometimes to excuse the fact that I am slow with grading or posting assignments and sometimes to illustrate that I do understand that life happens) because I believe my life is also a teaching opportunity. My students know I am married and have a teenage son and that my dog died last summer. They also know my father has Parkinson’s and some of the burdens that disease has placed on my family. I know that some of my colleagues think I am chump for giving my students so much leeway with their work, but showing my students empathy and respect does not cost me anything. If my students are struggling and I am not human enough to understand then I deserve to be lied to. If my students are simply liars then ultimately who is harmed? I am not harmed for being human and believing their lie. I would rather swallow a dozen lies than cause one student more pain. Where do you fall on the educator spectrum? Which matters more to you – the students or the rules? How do you show your students respect and empathy?